We are committed to developing long term working relationships with our clients. We do this by providing the best quality products designed for long term seamless use with minimal long term impact to the environment, and by being up front and honest about what we can and will deliver. This process is designed to build a working relationship while gathering the necessary information to create your custom tour. Our goal is your complete satisfaction with the services we provide. At the end of each phase if you are not completely satisfied with our services, all deliverables are yours to use. Give us a call or if you would prefer e-mail us and we will call you. This will start the Consultation Phase. Phone: (218)865-0266 E-mail: info@geronimoconstruction.us You can also reach us through our Contact Us page. This phase can be anything from one phone call to several phone conversations and emails. At the most basic it is you answering questions about your program goals and potential site and us providing feedback as to what type of course and configuration would best meet those criteria. At the more complex it can be several phone calls and emails including gathering of additional information and exploration of the benefits and drawbacks of a course. We will use our experience to point you in the right direction whether that is an immediate Feasibility Visit, or a list of question that you will want to answer before you proceed. Deliverables: The warm feeling of knowing what is possible and that there is someone taking the time to answer your questions. This phase builds on what we learned during the Phone Consultation. We will come to your site to meet with you face to face and explore your site. We will use this time to discuss in more detail what you desire from your course and outline what the site has to offer. By the end of our visit we will determine what type of course will both meet your program goals and utilize and show case your site. This process can take as little as one (1) day or up to seven (7) days depending on the size of your site and the scope of the proposed project. We can typically estimate the number of days we will need during the phone consultation. Once the feasibility of the project is determined we move onto the Layout Phase. Cost: Because at this point in the process it is still unclear if a course is feasible, we try to keep the costs low. We charge, at cost: Travel, Food and Lodging (if not provided by you) and a nominal daily fee for our time on site. At this point we will also provide a cost and time Estimate for Installation based on the Feasibility Findings. Once the feasibility of the project has been determined, and you have decided to continue with the project, we will determine with you the scope of the project. This will be a combination of the program goals we have discussed in the previous phases and the possibilities of the site we observed when we were on site for the Feasibility Visit. The length of this process will vary greatly based on the scope of the project and the size of your site. It can range in length from two (2) weeks to six (6) weeks. This process is typically split between time on site exploring and surveying your site and time off site calculating and mapping. Throughout the Layout Process we will present you with course options and collaborate with you to select the one the meets your vision. We do this to ensure that the final planned course meets your goals and vision. If you choose to continue with us the Course Layout Map will be the one we use to complete the Installation and Design. Cost: Contract price based on scope of project and locations. This price includes all of our travel, food and lodging as well as a professional survey and arborist's or forester's tree report if needed. Deliverables: By the dates outlined in the contract for the Layout we will provide you with a definite Course Layout Map. The Course Layout Map will include Surveyed attachment points, including locations and heights (whether they are trees or man-made structures), length of elements, type of elements, necessary logistical supports (trails, buildings, etc.) and tree health report (if trees are being utilized for support structures). This Layout defines the course that, upon installation, will achieve your program goals and vision. At this point we will provide you with a Bid and Installation time frame based on the findings of the Layout Phase. Based on the Course Layout Map we will design and install all necessary structures for the course from entering the course to exiting to the ground. We can also provide all of the logistical requirements as well (roads, trails and buildings) if desired. We will design any structures necessary for the course including platforms, towers, etc. Because of our industry leading designs and planning we are able to utilize structures we have already developed and modify them as necessary for your site. This keeps design cost to a minimum and shortens the installation timeframe. Please see our Designs page for information on our industry leading designs. The Installation and Design process will vary greatly depending on the size, scope and location of your course. The necessary time can range from a few weeks to a few months. Cost: Contract price based on scope of project and locations. This price includes all travel, food and lodging. Deliverables: Upon completion of the Installation phase we will provide you with a completed course ready for training and operations. 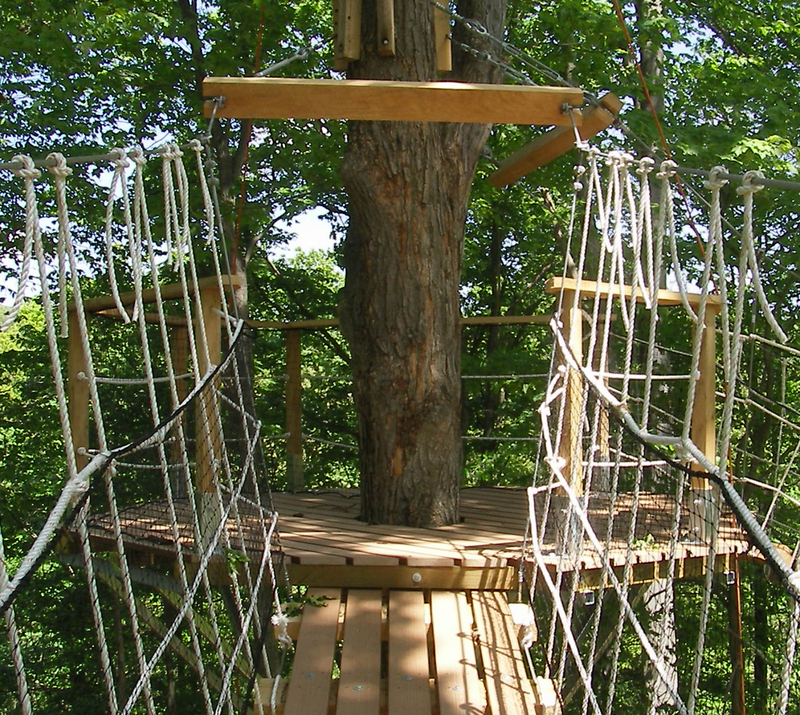 We will also provide you with an Installation Report outlining the structural components of the course and their compliance with the Association for Challenge Course Technology (ACCT) standards. We will also provide you with maintenance logs and check lists to maintain your course between professional visits. Operations to help your staff efficiently operate the course from welcoming participants, effective time and space management on the course through traffic flow and logistics use. Ecological training. We will develop lesson plans for your guides to use and talk about as they guide participants through the course. This may include unique features of the area, flora and fauna types and identification and historical information about the area. Deliverables: Upon completion of the training we will provide certificates of completion to all of the staff trained as well as safety manuals tailored specifically to your course.